Do you feel like your yard stands out? Maybe your yard stands out for all the wrong reasons? If that is the case, you’ve come to the right place. So, read along to get more advice to improve your yard. While plants are important, they aren’t everything. When making plans for landscaping, it is not hard to get carried away with the plants that are sure to grow in your area. It is important to think about using non-organic elements as well. A birdbath, bench, arbor, or rocks can add depth and interest to your yard, especially at times when your flowers are not blooming. Landscaping is more than planting a tree or laying down sod. Landscape design also includes water features, decorative elements and walkways. Pergolas, birdbaths, archways and decks add beauty and make a yard look more interesting. You can purchase less expensive or more expensive versions of these elements, depending on your budget. Plan your landscape so it looks nice year round. You need to have plants that bloom in the spring, those which continue to bloom in the summer, those which change color in the fall, and even some evergreens for the wintertime. A landscape you can enjoy year-round will please you every day. If you would like lots of color, but have a limited budget, consider wildflowers for your yard or garden. You can find wildflower seeds at most home improvement stores. Just scatter them over a large area or anywhere that is difficult to plant. With the seeds, you’ll get a variety of flowers of all colors and types. You can also cut the wildflowers to bring inside to arrange in your home in lovely bouquets. Try to use fundamental design techniques for your landscape. Anchor plants will add continuity to your yard. 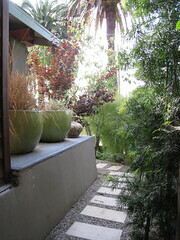 Also use repetition of the same variety of plants to create unity. You can easily balance your yard by plating in patterns and keeping an area filled with a single type of plant. Plants that differ in their leaf textures can offer a lot of variation. Remember that very large plants, like trees, will leave a shadow. This can be helpful when trying to protect your patio or house from the sun during the summer months. Avoid placing smaller plants where they will be in this shadow. Landscaping can affect your property in other ways. If you are careless about the size and placement of large shrubs or trees, their root systems may affect your home’s plumbing system or crack your driveway. Their size may block your view when driving on and off your property. Therefore, it is important to consider these things carefully when planning your landscape design. Using peat moss is a very good way to ensure that your plants survive. Peat moss gives your plants lots of nutrients that they may otherwise be lacking. On top of that, peat moss can also offer a very attractive contrast to other areas of your landscape. Landscaping is an enjoyable and productive hobby for anyone, not just the professionals! With some imagination and a willingness to work hard, you can create beautiful landscapes with your own two hands. Your neighbors will be quite jealous of your new landscaping, and the entire town will be talking about it! The best outcome is having your neighbors be jealous of your work.